In the previous article we tested and reviewed Cyclone’s Hedge Shears and Telescopic Wavy Edge Hedge Shears, and in this product review we’ll have a look at their Compound Bypass Lopper, Ratchet Anvil Lopper and Telescopic Ratchet Bypass Lopper. NOTE: If you’ve read the previous article you’ll notice that we retain the same format and repeat some of the common information for your convenience – this way each product review is a stand-alone article and you don’t have to switch back and forth! Garden loppers are heavy duty two-handed pruning tools that look like oversized secateurs with long handles. 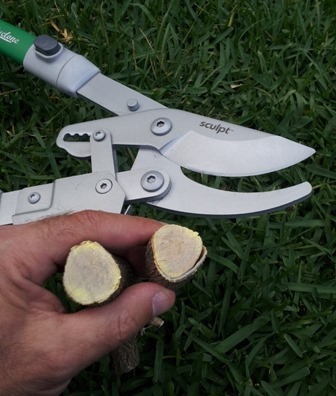 They are designed to cut thick branches, one at a time, as opposed to hedge shears we reviewed earlier, which look like large long-bladed scissors and are used to cut many small branches all at once with each cut. Secateurs do the same tasks as loppers, just on a smaller scale. They are single-handed tools that come in left and right-handed versions, which are used for accurate cutting of twigs and thin branches up 20-25mm thick (3/4”-1”) depending on the size of the secateurs and how strong your hands are. Loppers are quite different, they two-handed tools which have long handles, allowing for far more powerful cuts to ne made with less effort. Many loppers use special mechanisms such as compound levers, gears or ratchet mechanisms to give the user more mechanical advantage to exert way more power. Having a greater cutting capacity, loppers are used to cut branches of various thicknesses from from fairly thin right up to 45-50mm (1-3/4”-2”) thick depending on the cutting capacity of the loppers. 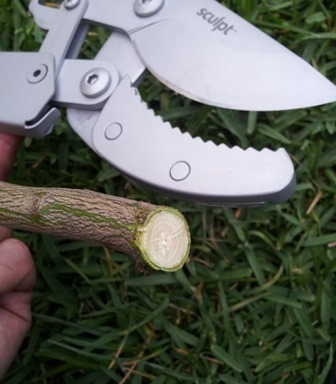 Branches thicker than this should be cut using a pruning saw – don’t abuse your loppers by trying to make big cuts on very hard or dead branches! 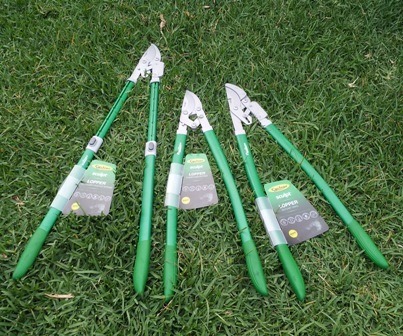 Credits: Cyclone Tools Pty Ltd – Loppers are two-handed tools with longer handles for heavier pruning tasks. This is an example of a compound lopper that uses a compound levers (a series of levers linked together) to multiply the cutting power of the tool. There are two types of loppers, bypass loppers and anvil loppers. With bypass loppers, the top blade which does the cutting moves past a lower jaw which usually has a square edge which holds the branch being cut in place. 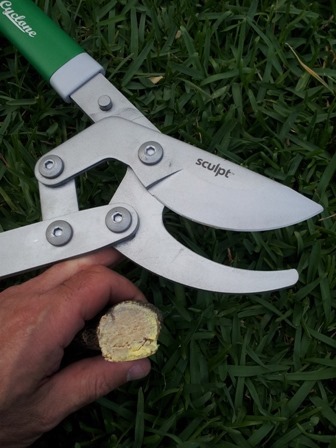 Bypass loppers, just like bypass secateurs, are more popular than the anvil varieties because the bypass blade produces more accurate and cleaner cuts, and it allows for cuts to be made closer to the trunk. This is because bypass loppers have a chisel-style blade, which is flat on the inner side with the angled grind or bevel on the outside only. if we look at the blade cross-section, it looks like a ‘V’ split in half – more like this – ‘|/’. It is important to note that bypass loppers and secateurs are sharpened from one side only, the outer sloping or bevelled side. Bypass lopper blades cut past each other for cleaner cutting. Anvil loppers have a very different blade system. The the top blade which does the cutting presses into the flat ‘anvil’ surface of the wide lower jaw which holds the branch being cut in place. This type of blade can cut well against hard timber because it is shaped like an axe blade with a ‘V’ cross section and sharpened on both sides. The reason that anvil loppers are less popular is because they may crush and damage softer. smaller branches, resulting in an untidy cut that may become an entry point for disease. Where anvil lopper really outshine bypass loppers is in cutting tough or difficult materials. Bypass loppers can jam when cutting very fibrous or very hard materials, the blades may be forced apart with the uncut material binding between them, especially when forced. Anvil loppers on the other hand, cannot jam because the blade presses into the flat surface of the lower jaw, allowing the use of great cutting force on difficult-to-cut materials without the chance of jamming. Anvil lopper blades cut against each other for tougher materials. So clearly, both bypass and anvil loppers have different strengths and have a rightful place in the garden shed! Loppers can also have telescopic long handles which allow for extended reach and greater leverage for increased cutting power. Long handles are not the only way to increase the cutting power of loppers though. It’s easy to increase the cutting power through the use of basic mechanisms which multiply the cutting force at the blades for less effort. Compound loppers utilise compound levers, basically a lever driving one or more other levers to increase cutting power. Gear mechanisms allow the handles to open wider apart than normal and convert this longer, easier movement at the handles to a much more powerful cutting action at the blades. Ratchet mechanisms allow the blades to hold the cut in position while the handles can reopened to get better leverage and be closed again, as many times as necessary. The handles may be ‘pumped’ repeatedly as far as you can close them to gradually work the blade through a thick branch. Now that we’ve covered how loppers are used and how they work, let’s test the three new Cyclone garden loppers! 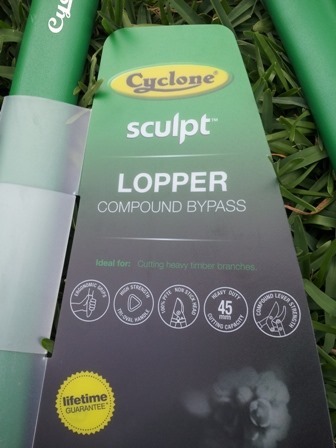 Credits: Cyclone Tools Pty Ltd – Compound Bypass Lopper ($69.98) – designed for thicker branches thanks to a compound lever that enhances cutting strength.. Credits: Cyclone Tools Pty Ltd – Ratchet Anvil Lopper ($74.98) – designed for mature woody branches, with a ratchet mechanism and anvil blade that multiply cutting strength. 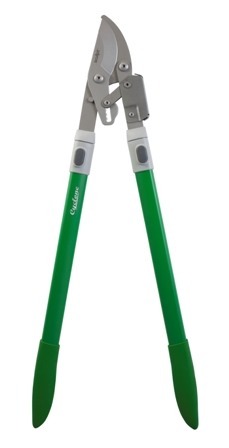 Credits: Cyclone Tools Pty Ltd – Telescopic Ratchet Bypass Lopper ($87) – great for those difficult branches, requiring extra reach and cutting power, thanks to long-reach telescopic handles, a ratchet mechanism multiplying cutting strength and bypass blade that cleanly slices green branches. Just like the hedge shears in the Cyclone ‘Sculpt’ range, these loppers are very stylish in their design and eye-catching. They are very professional looking, their appearance just says ‘quality’. The choice of colour, a vivid greens, is both tasteful aesthetically, and functional by by design as the colour stands out amongst the greenery so that they won’t be easily misplaced. The grips on the handles are also the same as those on the ‘Sculpt’ range shears, they are made of a firm and durable material with a very good grip, some sort of hi-tech material that I can’t recognise off hand. In the hands, the grips are very comfortable and ergonomic. I have large hands and I find there’s plenty of space on the grip with room to move up and down. Being a technical writer, I really appreciate informative labelling, and these labels are well designed, they tell us a lot about the product. In this section we’ll review the labelling which describes the features of these tools. The labels are well designed and makes tool selection easy by identifying the intended use, and for the Compound Bypass Lopper the intended use is described as “Cutting heavy timber branches”. 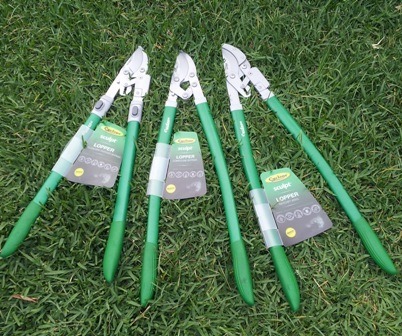 The label also tells us these hedge shears have ergonomic grips, high strength tri-oval handles, 100% PTFE Non-stick Blades (these blades use the tried and proven Teflon coating, which also explains why they would also be rustproof), a heavy duty 45mm cutting capacity, and ‘Compound Lever Strength’ (these loppers use a compound lever mechanism to multiply the cutting force applied at the handles). There’s also a lifetime guarantee, which speaks very clearly about the confidence that Cyclone has in the durability and quality of this product range. 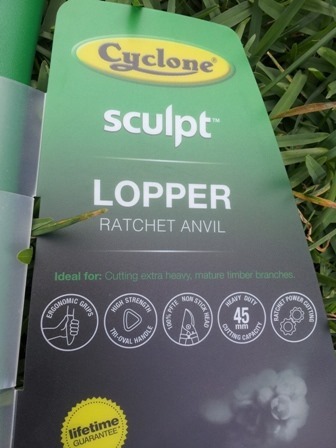 The label for the Ratchet Anvil Lopper describes the intended use as “Cutting extra heavy mature timber branches”. Just like the Compound Bypass Lopper, this model also has ergonomic grips, high strength tri-oval handles, and 100% PTFE Non-stick Blades, a heavy duty 45mm cutting capacity, ‘Ratchet Power Cutting’ (these loppers use a ratchet mechanism to multiply the cutting force applied at the handles) and a lifetime guarantee. 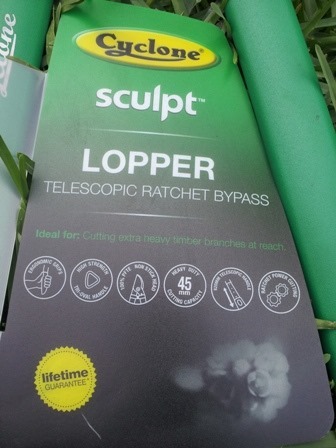 The label for the Telescopic Ratchet Bypass Lopper describes the intended use as “Cutting extra heavy timber branches at reach”. Just like the other two loppers in the range, this model also has ergonomic grips, high strength tri-oval handles, and 100% PTFE Non-stick Blades, a heavy duty 45mm cutting capacity, ‘Ratchet Power Cutting’ (these loppers use a ratchet mechanism to multiply the cutting force applied at the handles) and a lifetime guarantee. The additional features this model boasts is the extendable 820mm telescopic handles. As far as first impressions go, these Cyclone ‘Sculpt’ loppers look great, handle well thanks to their ergonomic design, and feel very solid and dependable, real heavy-duty tools. 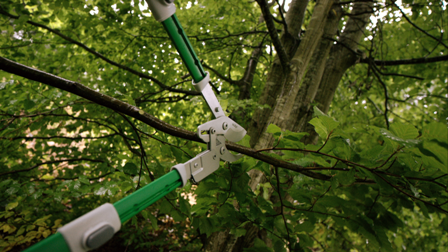 Let’s see how they perform doing the job they’re designed to do – pruning! The idea of testing out three heavy duty loppers to see what they could really do instinctively appeals to any tool buff, and personally I was quite excited by the opportunity to put some quality engineered tools to the test. Side by side, all these loppers are fairly similar in size, and therefore similar in reach and leverage that can be exerted by the handles. They are all approximately 800mm long from the tip of the blade to the end of the handle. This gives me about 2.5m of comfortable reach and I’m not tall! All three loppers out in the garden ready for testing! Extending the handles on the telescopic lopper shows how much bigger this beast actually gets. Fully extended the telescopic loppers are a whopping 1050mm long from the tip of the blade to the end of the handle. They gives me about 2.8m of comfortable reach. If you’re over 1.8m tall, you’ll be able to prune branches 3m high without a ladder! Telescopic lopper extended, size comparison next to other two loppers. Clearly, they have reach, but there’s no point reaching a thick branch if you can’t cut through it. Since these are all heavy duty loppers, it was only appropriate to commence with some heavy-duty cutting tests to assess cutting performance. Please note that this next test is an extreme test and does not constitute normal or recommended use, especially for bypass loppers. Looking around the garden, I wondered what would constitute the hardest, nastiest test I could subject these loppers to. The rationale here is that if these loppers can cut through the toughest of garden materials, they can cut through anything else normally encountered with ease. 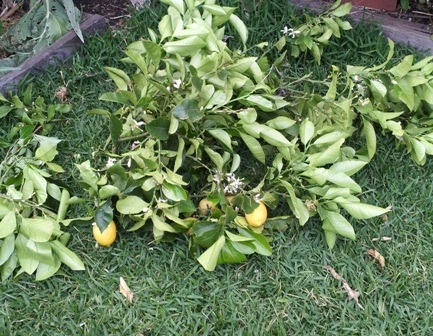 What caught my eye was a pile of one-year old, dry, hard, seasoned tight-grained lemon tree branches that were too hard even for my mulcher to handle when they were fresh! Mind you, my mulcher is one of those with a large, slow turning blade and a 2400W electric motor, more like a chipper, with a 40mm capacity, that happily digests 25mm hardwood garden stakes when I use them to push plant material through and they accidentally get eaten! For testing purposes I selected some of these hard, dried branches around 25-30mm thick to do the test cutting with. To get a sense of comparison, I first cut the branches with the biggest loppers in my garden shed made by another manufacturer – a pair of bypass geared loppers that unfortunately nearly open to 1.2m wide with the handles in a straight line (180 degrees) to each other when the blade is fully open, which are often impractical in a garden as the handles are obstructed by other trees, branches and other obstacles, but they have a crazy cutting capacity of 50mm and I use them mainly in open space to chop up tree trunks and branches that I first cut with a pruning saw and them move to a clear unobstructed space. These ‘other brand’ bypass geared loppers were able to cut through the hard, dry wood. Playing it safe, I decided to use the ‘bad boy’ of the ‘Sculpt’ lopper range that is specifically designed as the label specifies for “Cutting extra heavy mature timber branches”. The Ratchet Anvil Loppers were in their element, they cut very nicely and cleanly through the hard, dry test branch. Ratchet Anvil Loppers perform brilliantly on extra heavy mature timber cutting, it’s what they’re designed to do. This next part of the test can almost be considered abuse, cutting rock-hard, tight-grained dry timber with bypass loppers! To keep this in perspective, this wood is so hard you can’t put a nail into it, and it’s what you would use anvil loppers or a pruning saw on. Do not do this with your bypass loppers at home! Testing the Telescopic Ratchet Bypass Lopper , I used exactly the same piece of wood that I cut with the anvil loppers, and with about the same amount of force, I nearly made it clean through, and then I remembered these had a ratchet mechanism, which allowed me to reopen the handles while the ratchet held the blade in place and I squeezed the handles together a second time and the blades continued through their cut and sailed effortlessly through the branch. The ratchet mechanisms are amazing, they allow the blade to cut deeper with each gentle closing of the handles until it’s all the way through. If you can’t make it all the way through a branch with a single cut, slowly open the handles you hear a crisp ‘click’ sound as the ratchet locks the blade position. Push the handles back together to complete the cut. or repeat opening handles to a ‘click’, then closing handles again until the cut is completed. Using the ratchet mechanism is very simple, and the great news is that you can’t get stuck in a cut if you try to cut a branch that’s way too thick. If you open the handles all the way, it resets the ratchet mechanism and unlocks the blade, so you can abort a cut if you change your mind. So don’t open the handles all the way if you want to continue cutting. 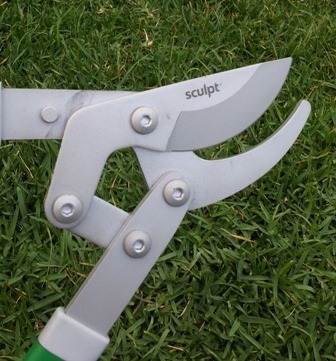 Ratchet loppers are great for gardeners with arthritis as they don’t require much strength to make big pruning cuts. You may be wondering what happens with the ratchet mechanism if you’re cutting thin branches that you can easily cut through with a single slice? It’s like the ratchet mechanism is not even there, you don;’t need to worry about it and use the loppers just like any other pair. The ratchet mechanism kicks in to rescue you when you don’t have the strength to make it clean through a cut by giving you many chances to cut a little bit deeper each time until you’re done! These bypass loppers cut through hard dry wood without jamming or spreading, and when you consider that you would only use anvil loppers on such timber, it really shows how tough this pair of bypass loppers are. Telescopic Ratchet Bypass Lopper handles the toughest cuts and the ratchet mechanism is magic for cutting through hard or thick branches. The Compound Bypass Lopper was the final one to endure this torture test, and once again I used the same branch of hard, dry wood for consistency. Remembering that the bypass secateurs need a little more force than the anvil lopper to get through hard, dry wood that they’;re not meant to cut in the first place, I put a little more strength into the cut and it sliced clean through in a single stroke without protest. Compound Bypass Lopper makes cut through hard, dry wood in a single pass! From this extreme test we can see that the anvil lopper can indeed do what it is designed to do, and that is to cut extra heavy mature timber branches. 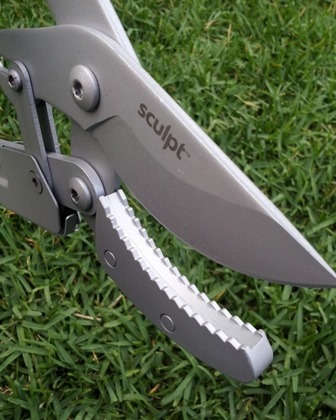 The bypass loppers have shown that they can indeed go beyond the call of duty to cut things that bypass loppers aren’t ever meant to be cutting. 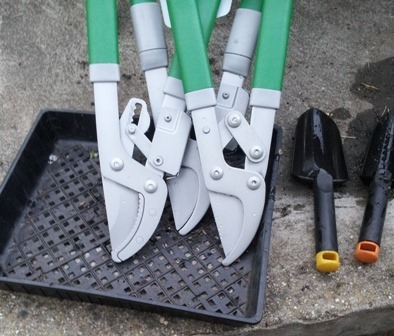 Having successfully passed the torture test, it was time for these loppers to engage in some real life pruning tasks. Once again I chose a lemon tree for its tough timber, but this time we had a more practical task, lowering the canopy of a well established Lisbon lemon tree, which grow up to 3m tall, down to a height where the lemons can be reached. This variety of lemons has thorns so it’s a job best done at arms length, or further! This was clearly a task where the bypass loppers could show what they could do. The telescopic loppers were able to reach the tallest branches and leaders, some of which were quite thick, to shorten then to a manageable height. The compound loppers are light and fast even on heavy cuts and made short work of the lower branches. Lisbon Lemon tree before pruning. 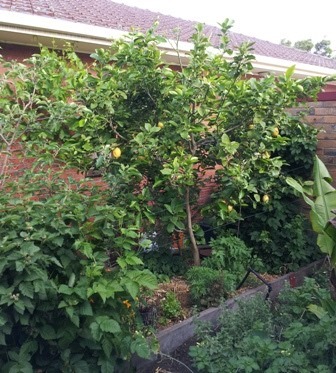 A smaller, tidier looking lemon tree pruned to a vase shape with lemons now in easy reach. Lowering the canopy of an established tree is a form of renovation pruning – pruning carried out to change the shape and size of a grown tree. With any pruning task it is best not to remove more than one-third of the canopy at any one time, as it can weaken the tree. Luckily only about one-tenth of the tree canopy was required to be removed in this instance. What was significant with this real pruning task as a test was that I was able to reduce the height of a 3m tall tree that has thorns without using a ladder and without getting scratched up, thanks to the reach of the telescopic loppers. In terms of design, the telescopic loppers are well balanced, reducing fatigue and allowing extended pruning session to be carried out at long reach. Having to hold up a heavy duty pruning blade on the end of long handles would soon become very tiring if the whole apparatus wasn’t balanced properly. The cuts from both bypass loppers were clean and accurate and the whole pruning task took only a few minutes, much faster than I expected. Climbing up and down a ladder takes a lot of time and effort and the branch you want to cut is always just out of reach and you have to climb down and reposition the ladder over and over. I found out how much more efficient it is when I could more around quickly on foot to any branch I spotted that needed pruning and used the telescopic bypass lopper for the longer cuts and the compound bypass lopper for the lower pruning cuts and detail pruning. Both bypass loppers performed effortlessly and very efficiently in their real-world pruning task. After seeing the spectacular job the bypass loppers did on the lemon tree, I had a feeling the tests weren’t finished and that something was missing. When I saw the anvil loppers sitting on the lawn on their own, I realised how unloved anvil loppers are by some gardeners who are quite opposed to their use. The reason often cited is that anvil blades can crush branches when they cut, causing damage to the wood which can serve as entry points to disease. As i had just pruned the lemon tree, I had plenty of fresh wood to try the anvil loppers on. I selected a branch about 2cm (3/4”) thick, and cut it with the Cyclone Ratchet Anvil Loppers. The result? You can see in the picture below – a clean cut without splitting the wood at all, nearly as clean as a the bypass loppers, with a tiny barely visible imperfection at the bottom of the cut where the bark wasn’t cut as evenly. Granted this was quite a hard wood even when fresh, and taking into consideration that anvil loppers are designed for a different purpose to bypass loppers, these anvil loppers make a respectable cut in small-diameter fresh wood. they may not be the perfect tool for the task, but from this test it appears that sharp, quality anvil pruners, while not being substitutes for bypass loppers, can in a pinch still do a decent job even when performing outside their intended purpose. Pruning equipment usually gets covered in plant and tree sap which must be removed otherwise it leads to staining or even rusting of the blades, and sometimes the stuff clings quite strongly to the blades and resists removal. Curious to see how well the non-stick Teflon coating on the blades works, I simply rinsed the blades under the tap, and much to my surprise and delight, the blades washed perfectly clean. I wiped them dry and propped them up to drain in case any water remained in the mechanisms or joints, and that was it, the fastest post-pruning clean-up ever. The non-stick coating really works well! Fast clean-up Teflon coated blades, no gunk, no fuss. Rinse under the tap, wipe dry and set up to air dry! As with their hedge shear stablemates, only time will tell how durable these loppers really are, and how well the Teflon finish wears, but during this short but intense test I possibly pushed them beyond reasonable limits and they really delivered, so I can can say that I believe these would be very dependable over the long haul. The lifetime guarantee gives me confidence as a gardener that these loppers will really last. I have to admit that these pruning tools are excellent for the tasks they are designed for, I couldn’t fault these, they were a pleasure to use and I look forward to using them for my next major tree pruning tasks. Telescopic Ratchet Bypass Lopper – my first choice because it’s such a versatile tool for heavy duty accurate clean cutting, with a ratcheting mechanism for extra power and a lot of extra reach for a small weight penalty. My personal favourite! Compound Bypass Lopper – if I were purchasing two loppers, already had long-reach loppers, or didn’t need long reach loppers, I would get this one for its sheer speed, mechanical simplicity and easy handling. It’s heavy duty, yet light, fast and very accurate and excels at detail work with reasonable reach. Ratchet Anvil Lopper – would be my choice if I already had a good set of bypass loppers and needed a super-tough anvil lopper for those really extra heavy duty tasks that bypass loppers could not handle. 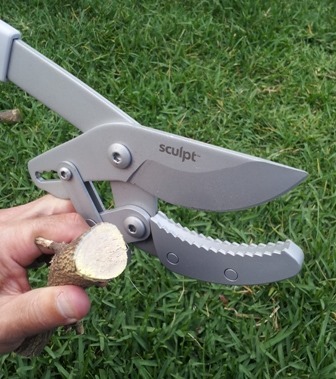 This is a specialized tool which is ideal if you often cut dry, dead wood or do lots of renovation pruning where you have to do a lot of cutting on mature trees. These sit between bypass loppers and pruning saws in terms of heavy cutting but cut faster and more efficiently than pruning saws on wood up to 45mm thick. I reckon Cyclone are on a winner with their new ‘Sculpt’ range. I am very impressed with the ergonomics, the build quality, the sharpness and the durability of these loppers. A lot of design has gone into these, and it shows when you use them, the way they feel, balance and respond through a range of pruning tasks. Deep Green rating for Cyclone ‘Sculpt’ range Garden Loppers is 5 stars! This entry was posted in Product Reviews and tagged bypass vs anvil loppers, Compound Bypass, cyclone, garden tools, Hedge Shears (658006), hedging, Lopper (659126), loppers, product review, Prune your Hedges to Perfection, Ratchet Anvil Lopper (659140), renovation pruning, sculpt, secateurs vs loppers, shears, Telescopic Ratchet Bypass Lopper (659171), Telescopic Wavy Edge Hedge Shears (658112). Bookmark the permalink.